Short shorts, long shorts, booty shorts, board shorts, flutter shorts, wrap shorts. It doesn’t matter what type of shorts you like but one thing is for certain, once the temperature climbs and the sun is shining everyone is wearing shorts. I’m not one for the super shorts, long shorts, or anything wild. I tend to stay with the classic cut shorts in chino or jeans that are usually 3 ½- 5 inches (inseam). Lately thought I’ve been wanting/needing to update my summer shorts look so I’ve picked 8 shorts I’m currently lusting over-all under $50! From bright colors to prints I’m in love with all of these shorts, my problem now is trying to decide which pair to get. 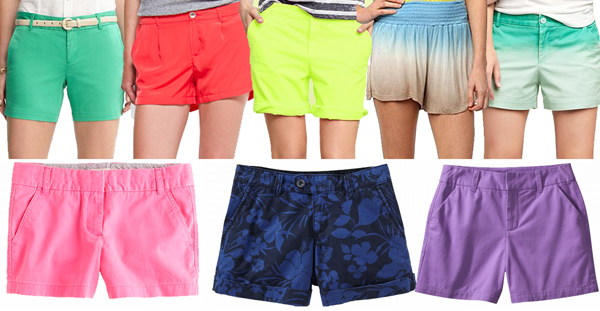 Will you be going bright and bold with your shorts this summer? I have the jcrew chino shorts and love them - neon pink is my fav. I love the neon old navy ones you have above! I'll have to go to old navy to search for them. Great picks. So in love with neon right now.